One of the latest technological innovations in the world of window treatments, Hunter Douglas presents PowerView® Motorization. This revolutionary new technology takes all the thinking out of adjusting window treatments. Honored with the prestigious Red Dot Product Award in 2016 for Cutting Edge Design and Functionality, you can now set schedules for your window coverings to adjust at specific times during the day or operate them from anywhere on earth using your smart device. PowerView® Motorization has many important benefits including increased privacy, security, home energy efficiency and peace of mind. PowerView® Motorization is a cordless, programmable, motorization system available on most Hunter Douglas window treatments. This revolutionary system can be operated using the ergonomic Pebble Remote Control from the comfort of your living room couch or from anywhere on earth via the PowerView® App on your smart device. 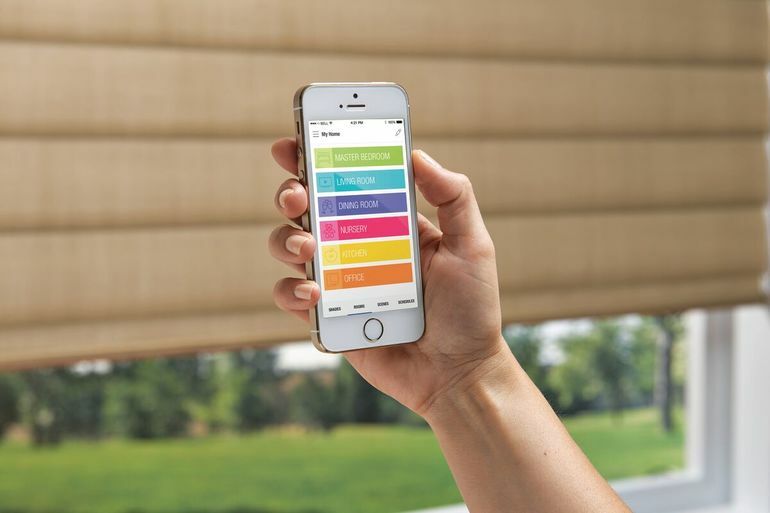 The option to schedule your motorized blinds and shades to close at specific times, for example, 30 minutes before the sun goes down, PowerView® gives you that extra layer of privacy that you never even have to think about. Schedule your bathroom windows to close just before the usual time for morning shower. Program PowerView® to work in concert with your existing home automation system to close your window treatments and turn on interior lights before you get home from work. A program to cycle your blinds throughout the day while you are out of town on vacation, giving the appearance that your home is occupied, is an excellent theft deterrent. PowerView® has the ability to work with other home automation systems, including thermostats, to help reduce the workload on your HVAC system and assist in cutting home energy costs. Program your window shades or blinds to close during the brightest, hottest parts of the day during the summer, reflecting away the brutal summer heat. Likewise, during the winter, program window treatments to open during the day, allowing the sun’s radiant energy to assist in heating your home. PowerView® has no cords and is either completely battery operated or hardwired into your home’s electrical system. This is an excellent option for households with small children and pets, where dangling cords is a constant safety concern. Call Red Star Paint and Decorating Center today! Our team of experts can answer all of your questions and help guide you to the right window treatment for your lifestyle. Stop by our showroom in Montclair, NJ to check out the latest products from Hunter Douglas. Proudly serving Montclair, Glen Ridge, Livingston, Bloomfield and the surrounding area, call us today to get started on your next home improvement project!